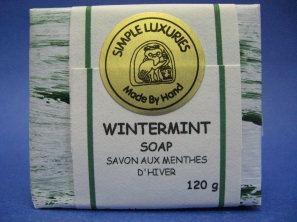 SIMPLE LUXURIES soaps are made by hand in small batches, with no animal fats or by-products, no synthetic perfumes, preservatives, artificial texturizers, colours or alcohols. They do use olive oil to make a mild creamy soap and coconut oil to give it a rich cleansing lather and to make the bar hard and long-lasting. They add wholesome milk to help restore a healthy pH balance to the skin, and as a result of the natural low-temperature soap-making process they use, their soaps contain lots of moisturizing glycerine. 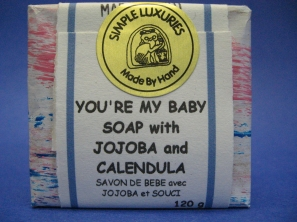 As a result of all this, these soaps are truly hypoallergenic and non-drying, even for supersensitive skin. 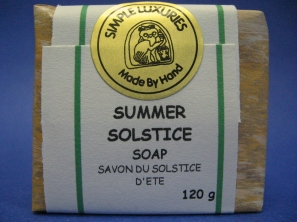 Because they contain no fillers of any kind, SIMPLE LUXURIES soaps last up to four times longer than most commercial soaps, and the wonderful scent lasts right up to the last tiny sliver. 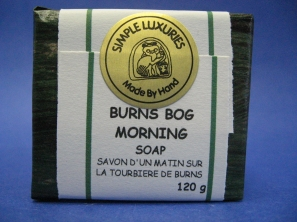 Truly, they are the very best soaps you could ever use, no matter how much you pay. Exceptionally mild and soothing (even by our exacting standards). Contains pulverized oats, comfrey root and honey with healing oils of eucalyptus, tea tree, lavender and calendula. Has been shown over and over again to help combat acne. Honey sweet almond oil and glycerine provide deep moisturizing. Olive oil makes it mild and coconut oil gives it rich cleansing lather. Intense green with earthy scent of rosemary and orange, with a hint of pine, to increase circulation to the skin and bring a dull complexion back to live. This all-vegetable soap is made with olive and sweet almond oils for mildness, and coconut oil for a rich cleansing lather. Invigorating. Made with strong coffee and spice, with coffee grounds for texture. Has a unique ability to remove stubborn cooking smells like garlic and onions from the skin. Surprisingly gentle. This all-vegetable soap is made with olive oil for mildness, coconut oil to make a fluffy cleansing lather, and sweet almond oil for extra moisturizing. Contains cornmeal and lots of fine pumice stone as abrasives and aloe vera to protect and heal cracked, dry skin. 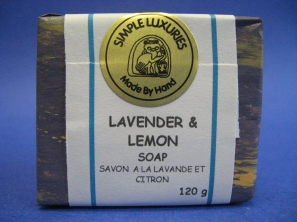 Scented with oils of lemongrass and cedar. This all-vegetable soap is made with olive oil for mildness, coconut oil to make a fluffy cleansing lather, palm oil to make the bar long-lasting and sweet almond oil for extra moisturizing. Sophisticated combination of scents. 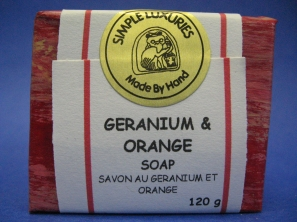 In this pretty handmade soap, citrus and geranium essential oils control excess skin oiliness without drying. A delicate swirl of pink clay draws out impurities. On a base of food-grade vegetable oils, olive and sweet almond oils contribute exceptional mildness. Coconut oil gives a rich cleansing lather and makes the bar hard and long lasting. Gold with a pink swirl. This all-vegetable soap is made with hempseed oil and is rich in essential Omega-3 and -6 fatty acids that contribute significantly to the health of your skin. Starting with food-grade vegetable oils, olive oil for mildness, coconut oil for a rich cleansing lather and wholesome milk to restore a healthy pH balance to the skin. 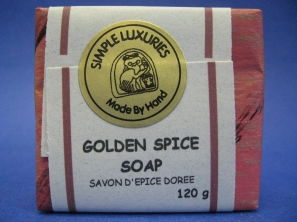 The natural soap making process gives this special soap loads of moisturizing glycerine as well. 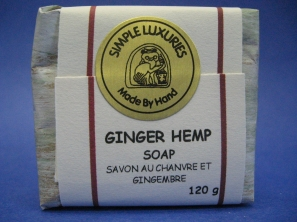 Ginger fragrance. Marbled with ground cinnamon, this festive handmade soap is scented with essential oils of winter spices and citrus. On a base of food-grade vegetable oils, olive oil for mildness, coconut oil to make a rich cleansing lather and a long-lasting bar and wholesome milk to restore a healthy pH balance to the skin. Sweet almond oil and glycerine from the natural soap making process make it gently moisturizing. Extra gentle soap. 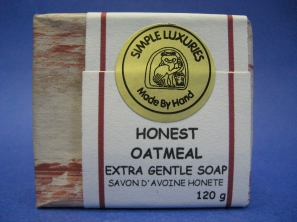 An unscented creamy bar that smells only of toasted oatmeal. Gently cleanses sensitive or irritated skin, leaving behind a soothing protective shield against environmental nasties. Jojoba oil conditions the skin as does the natural glycerine from the soap making process, while wholesome milk helps maintain the skins proper pH balance. 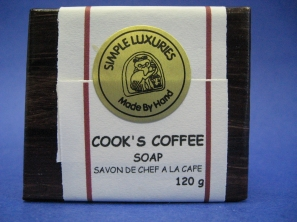 Olive oil makes for an exceptionally mild cleanser and coconut oil gives the bar a deliciously rich lather. 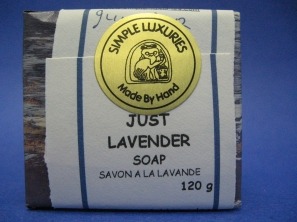 The beautiful lavender scent of this mild handmade soap comes from both the flowers and essential oil of real lavender. Lavender is calming, promotes healing and helps get rid of headaches. It is also believed to keep nightmares away. Using only food-grade vegetable oils, this soap contains olive and sweet almond oils for mild moisturizing and coconut oil to give a rich cleansing lather and make the bar last a long time. Golden with flowers. This handmade soap is about balance. Bright, invigorating essential oil of lemongrass blends with soft, soothing flowers and essential oil of lavender. On a base of food grade vegetable oils, it is made with olive oil for mildness, coconut oil for a rich cleansing lather and wholesome milk to help retain a healthy pH balance. The natural soap making process adds moisturizing glycerine and sweet almond oil for even more mild moisturizing. 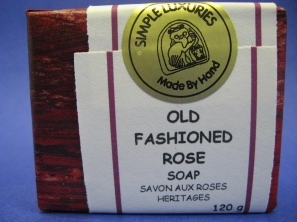 The heavenly scent of rose oil combines with elderflower-infused oil (a traditional treatment for wrinkles and freckles) in this rich handmade soap especially for dry skin. On a base of food-grade vegetable oils, olive oil for mildness, coconut oil for a rich cleansing lather and wholesome milk to restore a healthy pH balance to the skin. The natural soap making process contributes lots of moisturizing glycerine. 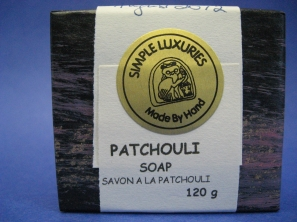 The heady, musky scent of this rich handmade soap comes from Indian patchouli essential oil which protects and moisturizes dry, mature or blemished skin. It is also believed to help with stress and out-of-control emotions. This all-vegetable soap is made with olive oil for mildness, coconut oil for a rich cleansing lather and a long lasting bar. Wholesome milk restores a healthy pH balance to the skin. The natural soap making process contributes lots of moisturizing glycerine and sweet almond oil adds even more gentle moisturizing. Made golden by sweet orange and with light musky undertones, this gentle handmade soap is as softly sensuous as a lazy summer day. On a base of food grade vegetable oils, it is made with olive oil for mildness, coconut oil for a rich cleansing lather and a bar that is hard and long lasting. Wholesome milk to restore a healthy pH balance to the skin. 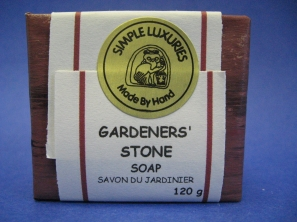 The natural soap making process gives it lots of moisturizing glycerine. Extra sweet almond oil has been added for even more gentle moisturizing. 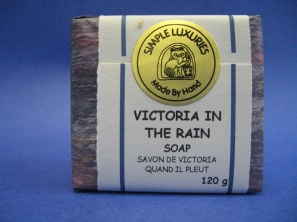 The fresh fragrance of rain mixed with the gentle scent of lavender give this ivory coloured handmade soap a graceful and somewhat old-fashioned quality. It is made with olive oil for mildness, coconut oil to give it a rich cleansing lather and sweet almond oil for extra moisturizing. Wholesome milk helps restore a healthy pH balance to the skin. The natural soap making process contributes loads of moisturizing glycerine as well. Freshly invigorating, this handsome soap is pale green with flecks of mint leaves and is scented with a heady blend of essential oils of mint, lavender and rosemary. Is clean, cool and refreshing. Soft green swirl of chlorophyll, with real spearmint leaves. It is made with olive oil so it will be mild, coconut oil to give it a rich, cleansing lather and sweet almond oil for an extra moisturizing boost. Wholesome milk restores the skins natural pH balance and the small batch soap making process contributes loads of moisturizing glycerine. 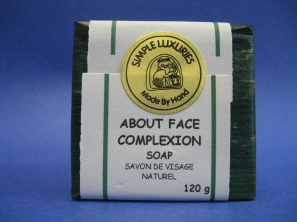 A pure simple bar, this handmade soap is safe and gentle enough for skin that needs to be babied. It has no scent except the clean smell of pure soap. It is made with conditioning jojoba and safe, gentle calendula oil that is anti-inflammatory and speeds surface healing. Olive oil is used for mildness and coconut oil for a rich cleansing lather and to make this soap last longer. Wholesome milk helps restore a healthy pH balance to skin that otherwise might react to soap of any kind., and glycerine from the natural soap making process makes this bar very moisturizing indeed.